After another few days feeling a little exhausted, I think it will be a miracle if I start blogging daily again before bubs is due. I hope you all stick with me while I'm taking a little longer to bring you projects! Here's a little comparison pic for you guys, with my first, Luke (grey) & now with my second (blue). Excuse the no makeup & slightly blurry pic - should stick to photographing cards haha! Today I have a really sweet & easy card I've made with the Christmas Pines Stamp Set & matching framelits from Stampin' Up! I have made this card for the What Will You Stamp Challenge & I'm also entering it into my Case This Card Challenge. I've used a Thick Whisper White base, layered with a piece of the Fancy Frost Specialty Designer Series Paper. I have lightly sponged the Fancy Frost layer in Mint Macaron & then stapled the sentiment & ribbon to the layer before sticking it to the base with Dimensionals. I have stamped the Noel sentiment onto Whisper White in Real Red ink & cut it out with the Stitched Shapes framelits on my Big Shot. I have also used the Big Shot to cut out the pine leaves from Mint Macaron cardstock with the matching Pretty Pines Thinlits. The leaves are stuck to the back of the sentiment with Tear & Tape. 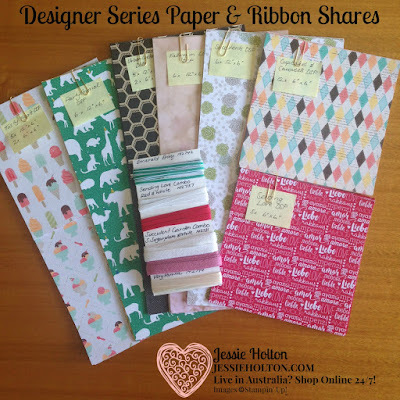 The ribbon is the Stitched Edge Real Red Ribbon & I have also added a couple of the Silver Metallic Enamel Dots. I have also used the Christmas Pines stamp set to stamp the inside of the card in Smokey Slate & Mint Macaron. 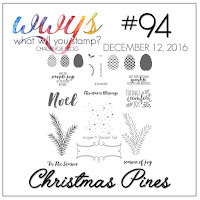 I have entered this card into the What Will You Stamp #WWYS94 Christmas Pines Challenge. 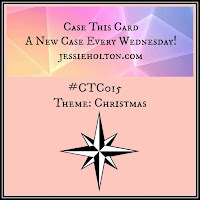 I have also entered this card into the Case This Card #CTC015 Christmas Challenge.